At the top of my list is the AudioNowCast. Jon Tidey of the Home Recording Show turned me on to it and I’ve really been enjoying it. The format of the show is an open round-table type discussion of several pro-audio related topics, often with guests. The regulars on the show include professionals in the industry – a songwriter, a movie post-production mixer, a sound designer (sound effects), a composer for television, and more. And, these guys have histories of playing in bands, sound teching on tours, and two of them even toured with Stevie Wonder in various capacities. Despite that these guys are day to day in the trenches playing with the big boys in LA (that’s Los Angeles, not Louisiana), the conversations are purposely aimed at the smaller home and project studio owners, and others who would like to play some role in the music business. Their comments are even useful and appropriate for a hobbyist like myself. I’ve really been enjoying this show and have been listening to the back episodes (starting from 17, the earliest one available on iTunes), at a rate of 5 per week. Good stuff, here. Thanks, Ryan! They currently record approximately every other week. Another suggestion by Ryan was the Sonic Talk Podcast. This podcast originates weekly as a live show every Wednesday and is posted the following day on iTunes. It features another group of music professionals, this time from both Britain and the USA via Skype. The live nature of the show leads to some interesting situations, such as when the host was talked into buying a Korg synthesizer live on Ebay. This is fun stuff. One I found on my own is the Electronic Musician EMCast. This consists of an expanded interview from the magazine. The give and take between the interviewer and the music professional is frequently entertaining, interesting, and educational. EM editor Mike Levin does a good job of keeping the interviewees on topic for amateur recordists. The last podcast I’m going to highlight in the post will appeal most to Apple Logic users. 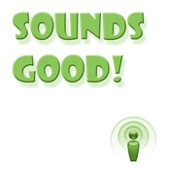 The Sounds Good podcast by Hens Zimmerman in the Netherlands is definitely Logic-centric, but there is enough general recording information for me to recommend it here. So, until next time, happy listening.